Take a look give us feedback,roll on the next one. 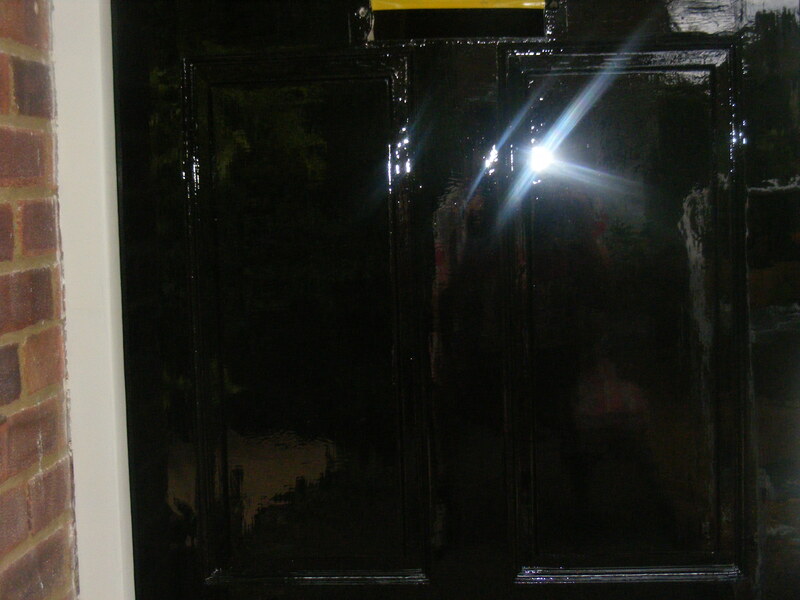 wow, is that a door or a mirror…?!! what a great result to be proud of. Very pleased,real satisfaction,cant wait for the next one. Thanks Jason for posting that. I know you worked really hard on this door and it looks a shiny beast for sure. This is what comes with lot of preparation, undercoating, sanding and then thin layers of gras a lacquer, topped off with oil based gloss wetted down between coats? 10/10 for going for the best finish you can get. Wow. How long did it take you? I have a door,frame and step to paint,the doors going to be black ,frame white,step,not decided on colour whats the best way,try and paint the whole thing the same day or paint door first,then next day frame,as for avoiding dust can anyone let me no if i have forgotten something,will wet path,my garden ,neighbors garden,going to put polite letter through door to ask to avoid striming,don’t wont any dust,as for laminated floor inside i will give a spray off water with spray bottle,and off course have a axa tag on me so when i am painting if i do spot anything its there to remove,but i also have a problem there’s a large tree by the house is this a case off if there’s a slight wind leave it,as for floor protection on day i use a anti static mat,up until now i have a pieces of ply and yellow caution tape stuck to it to protect floor,keep pressing on. Personally, I’d get the door and frame done in the same day. Undercoat one day, topcoat the next. I think avoiding dust is really tricky. On the one hand, it’s supposed to be better to gloss later in the day (read this somewhere) because it’s likely to be less windy. On the other, you want the paint on sooner so it can dry faster and cust can shut their door earlier! But if you’re earning your living this way, when it needs doing, it needs doing. Here’s a tip though: say you’ve glossed a door in the morning, now it’s many hours later and you’re about to shoot off. The gloss is touch dry, but still a little tacky so you know if the door shuts it’ll stick. Bit of fairy liquid and water on a small sponge, squeeze to make foam, and run that along your edges. Worth trying and has worked for me a good few times. I’d applaud your efforts to keep dust down - wetting down paths etc is not something I do myself - but I think you can never eliminate the risk completely. And if it’s not dust, it’s flies. This might sound cavalier to some, but sometimes there’s only so much you can do! What is the current best undercoat and gloss system for exteriors ? Thats not difficult to answer,ottex,and mironal,look on the internet for holmans specialist paints ottex primer undercoat gives a lovely smooth finish,to apply gloss to ,great company to deal with,if you don’t want to spend that much i would look at crown next generation,undercoat and gloss,my doors,have kept nice they were painted last year,haven’t yellowed like so many gloss do,hope this helps. 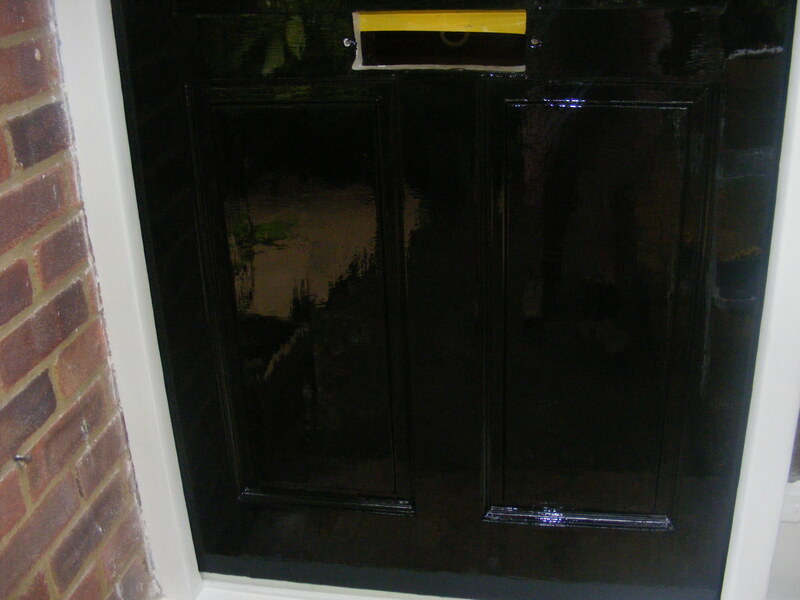 Hi folks got talking to a painter working on the harbour his job in the summer months is exterior doors,couldnt believe the quality of finish,for this he was using a yacht enmal,any thoughts? Hi folks I am starting to train my son in obtaining flawless finish, on doors,with touprett gras,what cheap paint can I use that can give me a high,gloss,that can be sprayed as well?he will be putting it on then when finished taken of so nothing fancy. Hi Andy what’s the highest gloss enamel, out there? if you are spraying Jason have a look at some of the polyurethane coatings from the car industry. and remember the surface prep is what will give you the shine not necessarily the paint. Nothing but the best advice from you teho,do you have a link?for any well known ones? Sikkens XD has a great reputation but is likely to be discontinued soon. Hollandlac Brilliant from Fine paints of Europe is very good too but not that easy to get hold of.